Seville is Spain’s fourth largest city (home to around 700,000 people) and to me, it feels like the perfect size–not too big, not too small. It’s one of the most walkable cities I’ve ever experienced, with tidy avenues lined with orange trees and the kind of architecture that makes even the most jaded traveller sit up and take notice. Its location in the western part of Southern Spain’s Andalusia region means it’s sunny, warm and an ideal spot to slide slowly into blissful siesta mode. There is no more iconic activity here than sitting on a rooftop terrace in the waning afternoon sun, red wine in hand, tapas selection at your elbow, chatting with friends and gazing out across the Guadalquivir River and parks full of palm trees, with the distant sound of a flamenco guitar floating up from the street. It is no cliché to talk about the passion here–passion for music, for wine, for food, for friends, for sunshine, for getting out and squeezing the most from each day. In Seville, to live like a local means more than just napping at 4pm and eating at 10pm–it means an adjustment of mindset. Even the most antisocial become social here. Even diehard homebodies can’t help but venture out into the streets to experience the colours, the flavours, the spontaneity and the gregarious warmth of this city. I stayed in a roomy AirBnB apartment not far from the Metropol Parasol, Seville’s modern, mushroom-shaped architectural wonder. My flat featured a sunny rooftop terrace, great Wi-Fi, a fully-equipped kitchen, a barbecue and even an outdoor bathtub! From the heart of Seville, you can stroll to ‘all the interesting stuff’ in less than half an hour. There are so many brilliant places to explore here that it’s hard to pick a single favourite. I loved meandering around the Santa Cruz neighbourhood, along the river and also down the spectacular Avenida de la Constitucion which is wide, free of cars and stretches from the town hall to the Plaza Puerta Perez. This boulevard features some truly stunning buildings (including the Cathedral) and a dizzying selection of chic bars and tempting eateries. Even here, in one of the most tourist-saturated parts of town, you can get an excellent meal with wine for $20-$30. On my first night here I had a huge and delicious paella for $21. Overall, prices in Spain are much cheaper than the rest of Europe. I splurged a lot in Seville, but I met other travellers who were getting by on less than $100 per day, staying in hostels and eating where the locals eat. 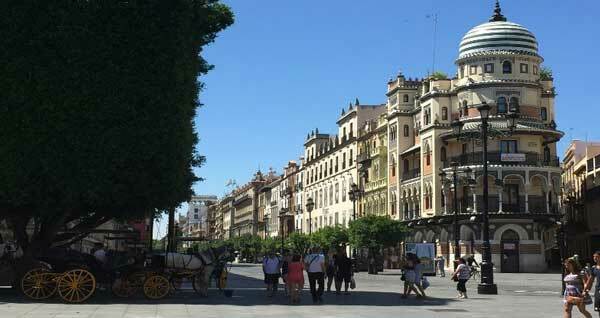 Seville has a welcoming, relaxed atmosphere and feels quite safe. The most popular attractions are easy to get to. The Plaza de Espana, which is 50,000 square metres of museums, canals, intricately tiled alcoves and horse-drawn carriages, is so grandiose it’s regularly used by film-makers (as seen in Lawrence of Arabia to Star Wars). Don’t miss the Real Alcazar, either: this huge maze of captivating buildings and superb gardens is the ultimate city oasis. When reading online reviews to plan your trip to Seville, it’s easy to get the impression that the main activity here is looking at incredible buildings. Nothing could be further from the truth–yes, Seville has more than its share of jaw-dropping history, but it’s also a colourful, modern city with efficient infrastructure, lively local markets, non-stop nightlife and access to a wide array of outdoor activities. When you visit, be sure to jump in with both feet and discover what the Andalusia lifestyle is really like. Take a cooking class, ride a bike through the suburbs, learn Spanish, walk across a bridge at sunset, indulge yourself with a wine tour and get caught up in the grace, power and energy of flamenco dancing. 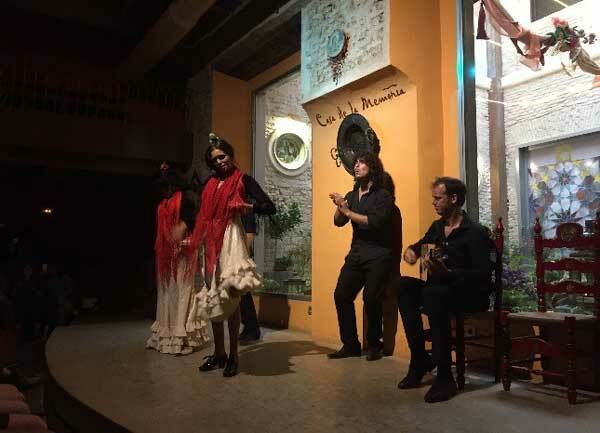 I took in a small, intimate flamenco show at the Casa de la Memoria on Cuna Street–a 16th century carriage house within the famous Palacio de Lebrija, right in the heart of the city. The performance cost €18, lasted about an hour and featured four supremely talented entertainers who danced, sang and played guitar. There’s a cosy tapas bar at the venue too. 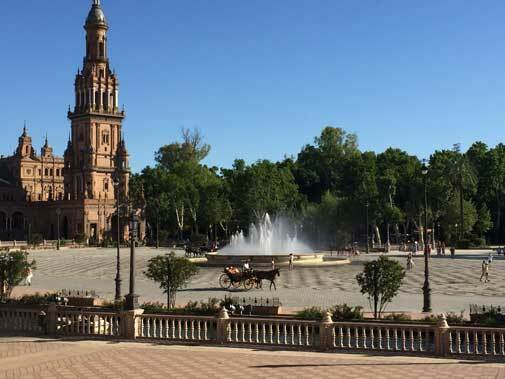 My top three travel tips for Seville? That’s easy: don’t forget the sunscreen, don’t forget to sleep (it’s easy to do here!) and don’t even think about leaving it off your bucket list.